Just because they were so stinkin' cute, I'm going back in the archives to bring you Steve at age four (1978), as... a little stinker! 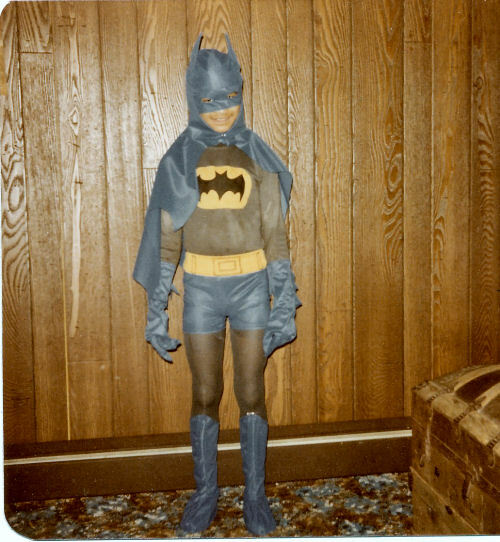 That same year, Josh wanted to be Batman. Yeah, we did costumes when the boys were in school, but as you know, I'm not a Halloween fan. 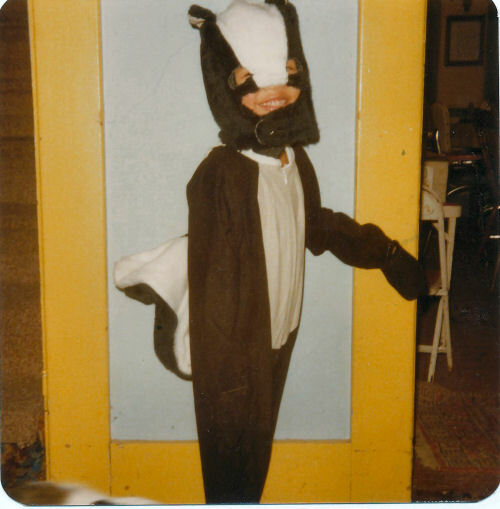 Actually, Steve was terrified of people in costumes until he was three. He sort of played with a Frankenstein mask that year, and wanted a costume the next year. 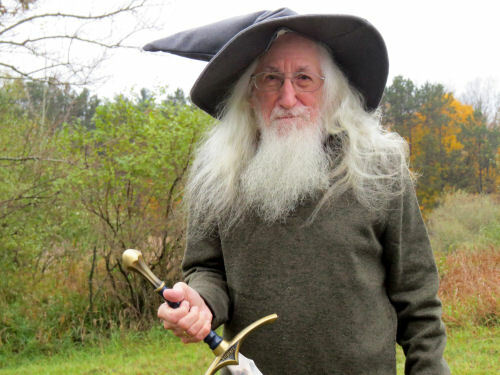 This year, Om went to town as his alter ego, Omdalf. He should have taken off the glasses at least for the picture, but we didn't think of it! In other news: laundry, grocery shopping, other shopping, did some outlining for Mistletoe. Somehow that took all day. Have you ever found an old photograph and been so startled by it you just could hardly breathe? That happened to me quite recently. Although I'm not letting myself get bitten by the genealogy bug yet (because I know I'll become totally infected and incapacitated to do much else), I have dabbled a bit on a website called findagrave. The value of what you can find on it sort of depends on whether a particular cemetery has an enthusiastic volunteer to add data and pictures. But the cemetery where a lot of my mother's side is buried is quite well represented. Now, let me first explain that I had no idea what this family member looked like before he was 72 years old. He ran away from home when he was 14 (in 1897) and was never heard from again until 1958. The family member is the oldest of my grandmother's brothers. She (Emily Marguerite Fisher) was oldest, then Ben, Lew, and Charlie. This family picture, taken in 1907 does not include Ben, because he'd been gone for ten years, and it's the oldest family photo I have. (Click the link if you want to read my thoughts on why I think it's remarkable). So I was cruising findagrave, I think to verify some death dates, and there was a link to Benjamin Smith Fisher's gravesite, with a thumbnail picture- way too small to see details. I clicked it. I'm guessing it had to have been taken just before he ran off. I can believe this boy was about 14 in the picture. But I have to tell you, seeing this took my breath away. Here's why. You've seen this next picture before, but not your whole life, as I have. 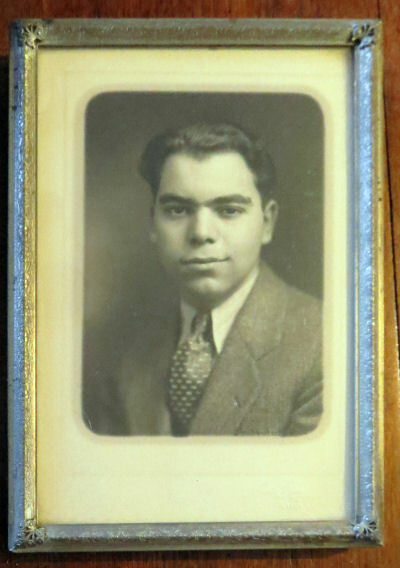 This is the formal portrait of my uncle Jacques (Merrill Fisher Rowe), who was killed at age 26. Jacques was Granny's firstborn, my mother's older brother. Wow! Can you say family resemblance? Here's the thing... it's like looking backwards into a long telescoping mirror. I've always been told I look like Jacques. When Granny started losing it, she began calling me Jacques (just say Jack- Granny liked the odd spelling). The next picture I'll show you is one I don't like much. 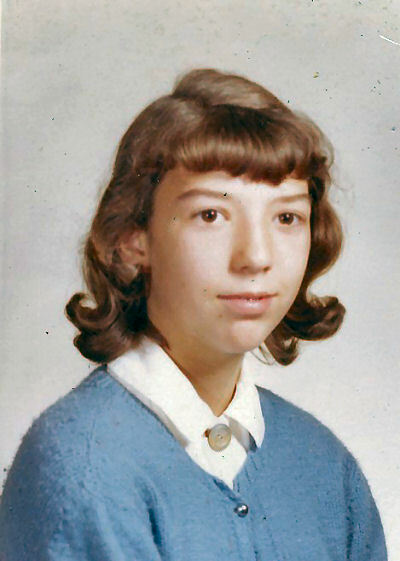 It was my 8th grade school picture, and my mouth was all swollen because I'd had braces put on my teeth the day before, but I was usually grinning with my mouth open, so this picture looks the most like the two above. Now let's back up a few years. I've promised in the past to hunt up these shots, but today I am delivering. 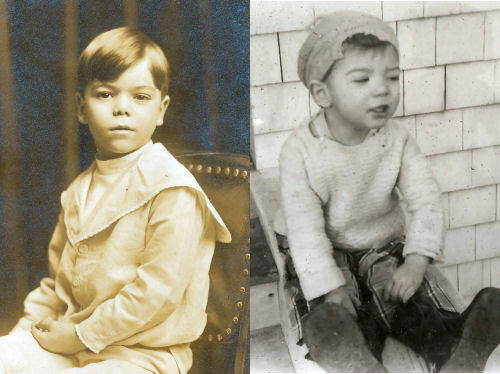 The first one is Jacques on the left and me on the right. 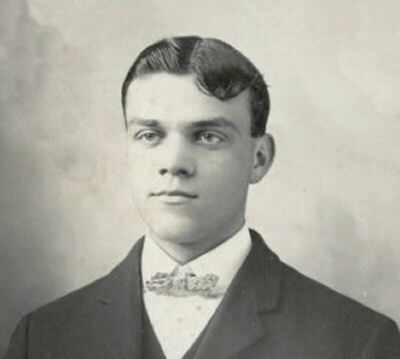 Ditto at slightly older ages. I really, really wish we could go back one more generation. Granny and Ben's mother (Catherine Louisa Hall Fisher) looked not at all like these pictures. I know I have one poor picture of Granny's father. I may have a couple of better ones. 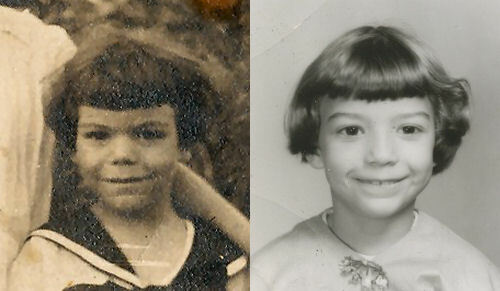 I have two snapshots of Ben that he sent when he suddenly got in touch with the family after almost 60 years. I can possibly compare how those two looked when they were older. So now I'm wondering if Ben, Jacques, and I look like Charles Alfred Fisher. Having this picture of Ben means a lot to me. 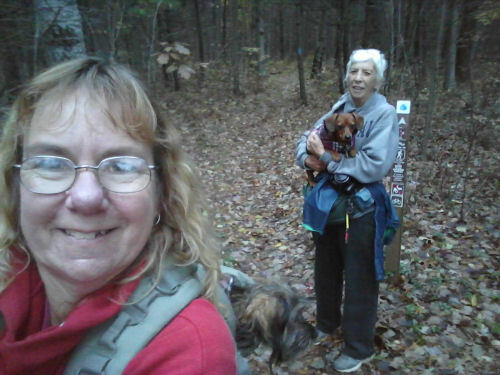 Sue and I live just far enough apart that getting together doesn't work all the time, but there is one piece of the North Country Trail that is about halfway between the two of us, so we snuck in a few miles after she got off work. Sophie and Anabelle have spiffy new jackets! 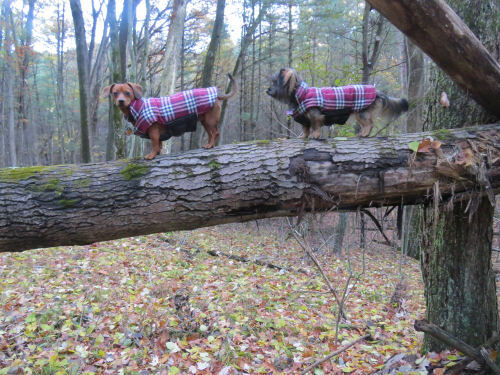 All the better to climb logs in. 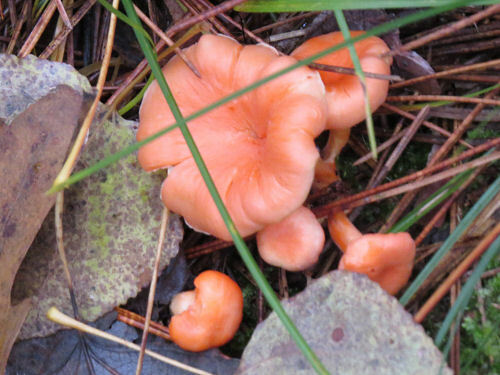 I think these might be a chanterelle not fully open. Just south of 8th St (just a dirt road) there is a long stretch of rail berm that used to be a spur of the Lake County Railroad. This was a narrow gauge logging RR built just to take timber out of the woods. This would be a good time of year to follow it beyond the NCT portion and see where it comes out. Maybe another day. 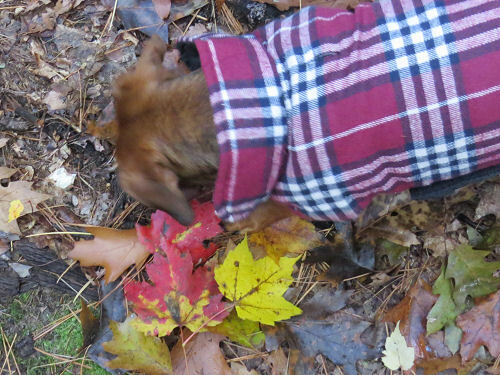 I wanted to show you a few last bright leaves, but Sophie apparently thought I was marking the spot where she should dig. When we were almost back to the cars the pups decided to run off and chase something- maybe a chipmunk. We had to corral them and Anabelle, who was naughtiest, had to ride in the pack the rest of the way. Oh! They also encountered something that scared Sophie. She was yelping as if she was being killed. Sue thought maybe a porcupine and we went running to rescue them. But no quills and we have no idea what they found. We did six miles. Glad Sue is able to be spontaneous from time to time. Hike 100 Challenge is at 87 miles. In other news: I wrote my newspaper column, and read over the chapters in Dead Mule Swamp Mistletoe that I have done. I was thinking maybe they were pretty boring, but I guess they are OK with one exception that might need a bit of tweaking. Tomorrow, it's back to writing on that book. Very quiet day here. Rain outside, reading a book inside. How about some bird pictures? 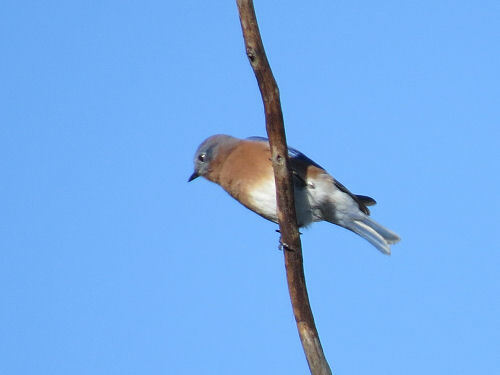 This was actually one of a flock of six bluebirds I saw this week. One year, there was a pair that even stayed here through the winter. I love the bluebirds! 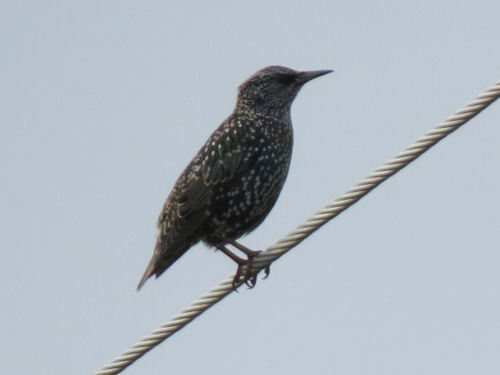 Of course, the starlings make their presence felt in the fall as they gather in huge flocks. But this one juvenile was just hanging out. I have to admit they are fairly attractive at this stage. 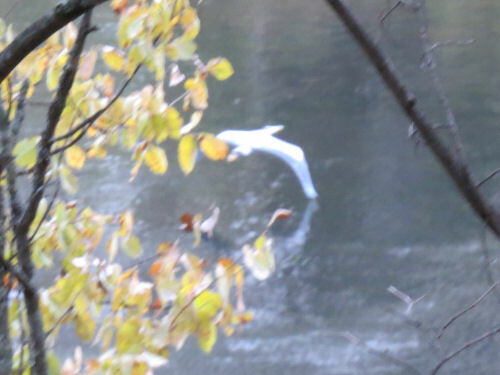 The oddity is this flying bird, captured mostly by luck on the Muskegon River. 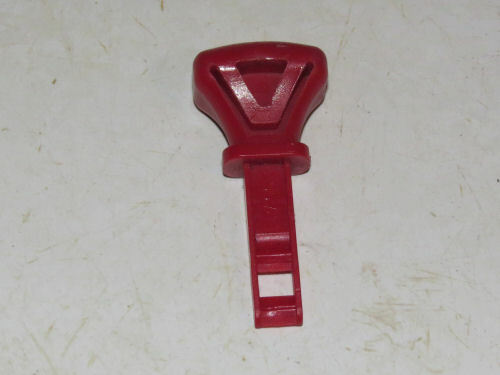 The picture is terrible, and I am only showing it too you because it's a bit of a puzzle. It's the size of a blue heron, and probably is a juvenile, or perhaps a leucistic one (mostly white), but the feet are quite pink. They really should be darker. As a result of my new friendship with author Ron Robotham, I have been reminded of an historical monument that is out in the middle of nowhere in Oceana County. For some reason, I never shared it on this blog. Today, I hunted through old pictures till I found it. If you are local and care, it's at the corner of Taylor Road and 144th Avenue, just south west of Walkerville. You have to scramble up through weeds to get to it. I think I cleared it off a bit to take these pictures. Cob-moo-sa was an Odawa (Ottawa) Chief who negotiated that his people would be able to remain in Michigan rather than be relocated to Kansas. Apparently there was a reservation with its northwest corner in Scottville, and southeast corner near Walkerville. The monument seems to imply it was within the reservation boundary. I have to like the meaning of his name, which is "Great Walker." 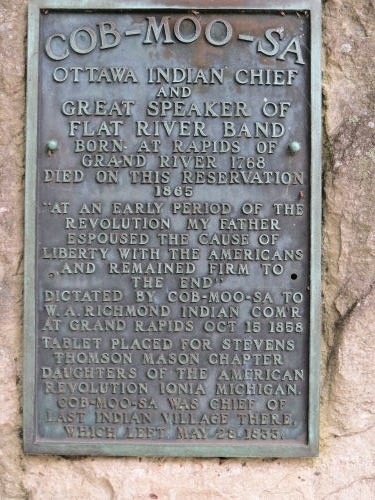 Here is the text of the monument: Cob-moo-sa, Ottawa Indian Chief and great speaker of the Flat River Band. Born at rapids of the Grand River 1768. Died on this reservation 1865. "At an early period of the Revolution my father espoused the cause of liberty with the Americans and remained firm to the end." Dictated by Cob-moo-sa to W.A. Richmond Indian Com'r at Grand Rapids, Oct 15, 1858. 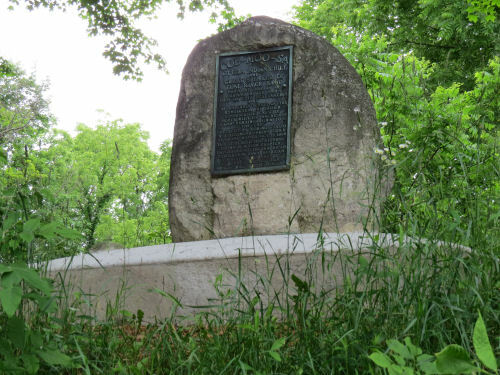 Tablet placed for Stevens Thomson Mason Chapter Daughters of the American Revolution, Ionia, Michigan. Cob-moo-sa was Chief of last Indian village there, which left May 28, 1835. In other news: I did a bit more mowing. 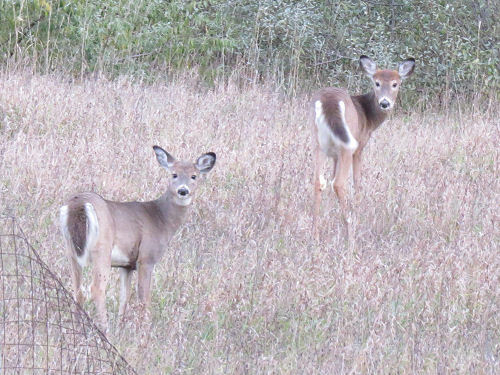 They are still here, and have banded with three other small deer to form a herd of five. It's much harder for me to be sure of identities any more, but I THINK this is Little Sister in front and Mr. Long-Legs behind her. They all have their drab winter coats on now. Another smallish deer got hit in the road out front, and I thought it was probably one of "my" group, but five deer showed up this evening, so who knows? They still think they own my yard. In other news: I got a fair amount of the yard mowed before it rained, in what I hope will be the final time of the season. Of course, the season got out of hand and I didn't manage to keep it down for most of the summer, but at least the autumn olive will be trimmed back before it gets a chance to go nuts in the spring. Should be another dry day soon to finish and do my trails. The deer don't seem so happy about the mowing. They are staying in the un-mowed spaces. That's fine too. Cathy and I took a little hike today. We could have done more miles if we'd stayed closer to home, but I was interested to hear a speaker in Newaygo, and she thought it sounded interesting, so we combined the events. 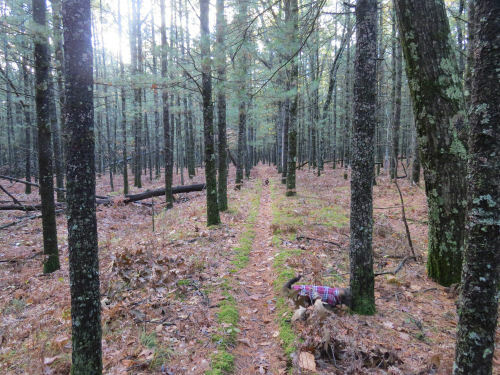 We drove to Newaygo and hiked about 4 miles on the North Country Trail near Croton Dam, which is at the southern end of the Manistee National Forest. 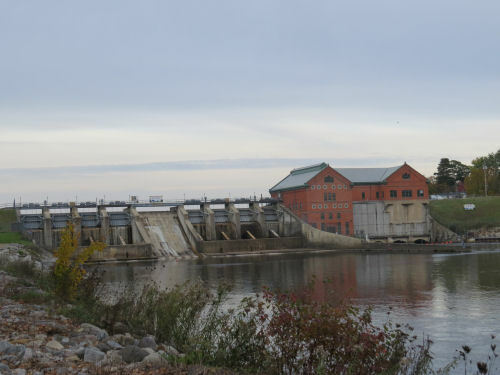 The trail follows along the Muskegon River for almost a mile. 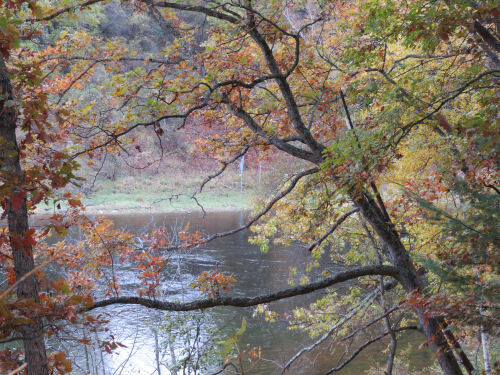 Even though the colors here have been rather muted, it was still beautiful with the light shining through the trees and the river beyond. This was my favorite. 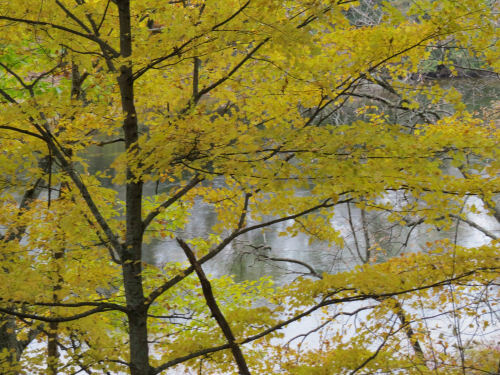 The oaks look so rich even if the colors are not bright. We hiked about four miles, which gave us time to eat the salads we took with us for dinner and get to the program. The speaker was an author I met two weeks ago, Ron Robotham. 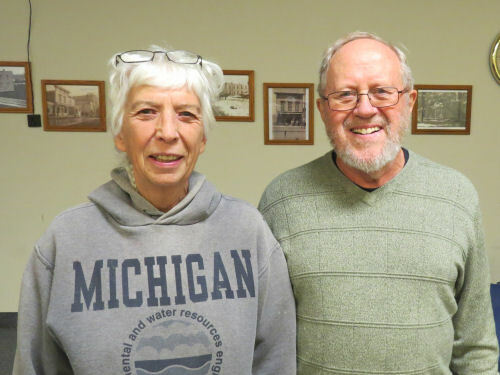 He gives a number of programs on West Michigan history. 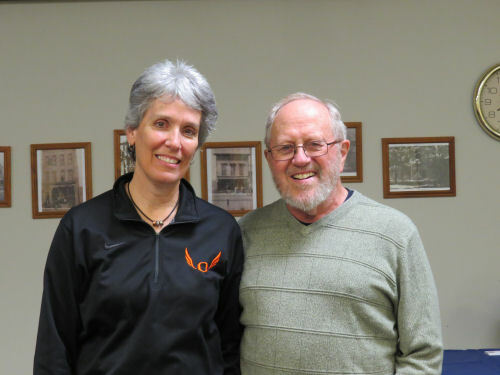 It was interesting, but it turned out to be even more interesting for Cathy because some of what he talked about meshed with her personal family history and the underground railroad! Small world. In other news: I actually got the forms filled out and approved so I can stop paying Amazon sales tax on the books of mine that I resell. That's a big deal! Hike 100 Challenge total inched up to 81 miles. Two mysteries today. I think I've got the first one narrowed down. The second is a complete head-shaker. On my recent hike, I snapped a picture of this flower in bud. As you may know, I think I'm pretty knowledgeable about plants. However, this one had me stumped. 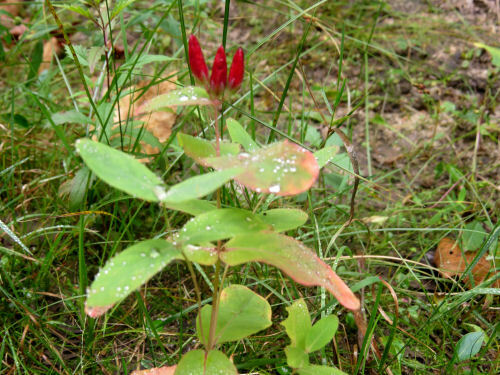 In the first place, it's in bud in late September. I've decided that's a fluke. So I've tried to narrow down the possibilities. I'm pretty sure it's a honeysuckle, Lonicera sp.. But it's certainly not one of the native ones in this area. Probably an ornamental variety that got planted by going through a bird's gut. Any input welcome. In other news: more bookkeeping, ordered more books, errands, laundry, and more yard work. Boring. 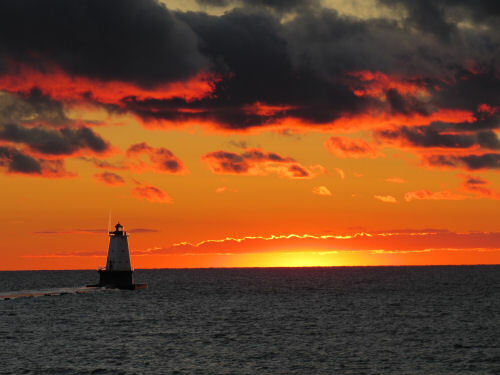 There's one thing about living on the west coast of Michigan. The sunsets are a thing to do. When I realized I would be in Ludington at the right time to catch one at the beach I had to go do it. Sure enough, the five-block-long parking lot was nearly full, but I found a space to turn in and catch a couple of shots. Hope you won't be bored by yet another sunset. The other news of the day was that Om and I did some yard work, and then I went to writers' group. The sunset was definitely the picture of the day. 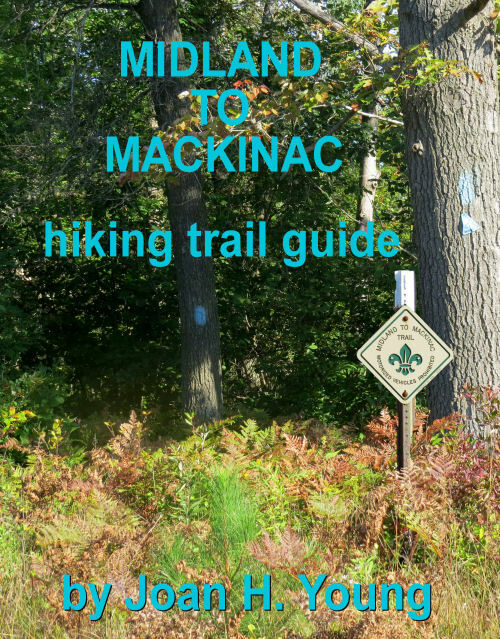 The first attempt at a Midland to Mackinac Hiking Trail Guide is ready to go. I decided that the effort is worth $4.99 which is a little higher than I was first thinking, but still quite reasonable. It's available only from Smashwords, and can be had in HTML (so you can read in a browser), as a pdf (so you can print a paper copy of the whole thing), and in two ebook formats: epub and mobi (so you can view it as an ebook if you wish, although I'm unsure how good the maps will appear on any given device. You should be able to expand them to see particular sections larger). The first 15% can be viewed without a purchase, which allows you to see the introduction, definitions, legend, one segment of description and a couple of maps. This should give people a chance to decide if they think it's worth a purchase. 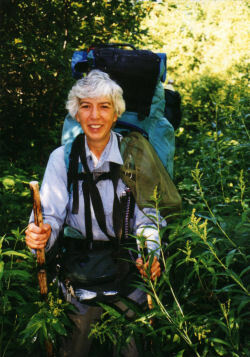 Go to Smashwords to see the Midland to Mackinac Hiking Trail Guide. In other news: I did a bunch of stupid housecleaning today, and trimmed back the rose bush I hate 51 weeks of the year. Fall seems to be winding down early this year. Both of the past two years I've thought we weren't going to get really nice colors here, but then at the last minute, the leaves brightened up and we had a week of glory. This year, I don't think we're going to get that. The rain and wind have already started bringing leaves down. I could be wrong- there are supposed to be several nice days in a row coming up. It's not even November yet. What happened to the wonderful clear October days we've come to expect? Today, as I did my same-old 3-mile road loop, it seemed as if the best things were the substantial fruits that last through the winter. 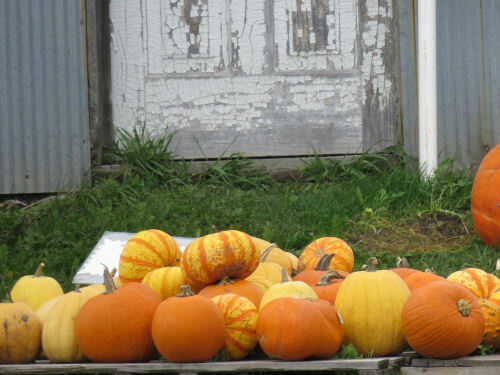 Pumpkins and squash. The wild roses have set their hips. I never got around to figuring out exactly which rose this is. Not multi-flora, at least! 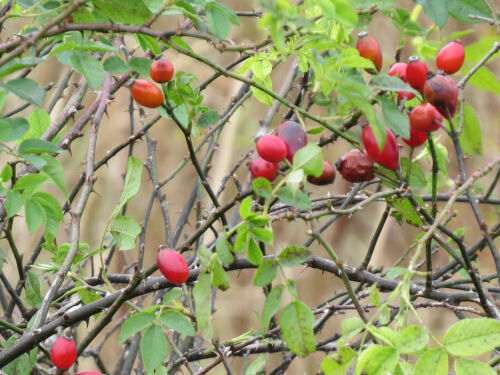 I've tried rose hip tea a couple of times, but was unimpressed. In other news: I did a bunch of bookkeeping and some miscellaneous tasks I need to do for people. Didn't finish that list. There's always tomorrow!